Infused with the intoxicating scent of geranium leaf, mandarin and bergamot, just the smell of this glorious oil will banish your stresses and whisk you away to the Med. A few drops swirled into bath water make for a soothing, skin softening soak; or massage directly onto damp skin, for instant hydration and a sense of wellbeing. 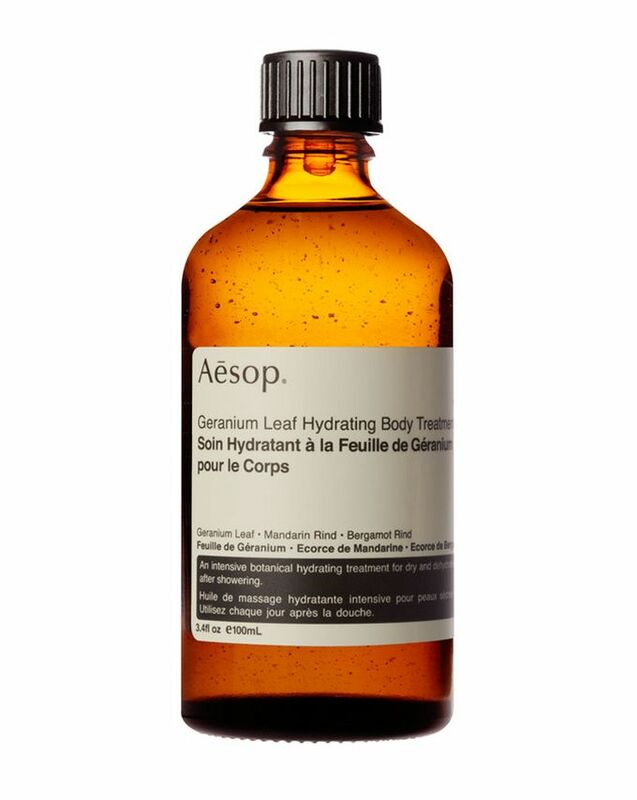 Rich with botanical extracts, Aesop's Geranium Leaf Hydrating Treatment combines potent skin care benefits with a heavenly fragrance, for radiant skin and a relaxed mind. This soothing body moisturiser and massage oil offers a concentrated moisture boost to dry, tired skin. It's non-greasy & easily absorbed to quickly re-balance and banish dryness, whether from cold weather, central heating or too much fun in the sun. Great for alleviating any tightness, Geranium Hydrating Body Treatment moisturises even the driest, most sensitive skin leaving it soft to the touch and superbly comfortable, while the beautiful botanical aromas combine to uplift and energise. Apply directly to damp skin to lock in moisture after the shower (or cajole someone into doing it for you). Otherwise, add a teaspoonful to a small amount of milk, and swirl through bath water for a truly indulgent soak. Prunus Amygdalus Dulcis (Sweet Almond) Oil, Macadamia Ternifolia Seed Oil, Corylus Avellana (Hazel) Seed Oil, Triticum Vulgare (Wheat) Germ Oil, Tocopherol, Citrus Aurantium Bergamia (Bergamot) Fruit Oil, Pelargonium Graveolens Flower Oil, Citrus Nobilis (Mandarin Orange) Peel Oil. Love everything about it: the smell, the results, the bottle. Got it in the Founder's Goody Bag but will buy it when it's finished. This smells amazing!! I use it after getting out of the shower and it leaves my legs and arms feeling very soft and smooth. I also love that the scent lasts all day. The only thing that would make this even better is if it came with a pipette to make it easier to get out the bottle and apply. I wish this stuff came in gallon drums! I was always picky when it came to moisturizers as I hated the stuck, tacky feeling. I use this oil as a moisturizer on the freshly washed skin. Even though it’s a slightly thicker oil my skin does not feel slimy or heavy. I absolutely adore this product! It needs to be sold in much bigger bottles. This smells so good and kind of gives my skin this luminescent, soft feel all day. My husband also comments on how good I smell. I hope they make a bigger size. This is a delicious smelling oil which I use after a bath and it sinks into the skin with relish, lasting well into the day. The ingredients are natural, which is great; however, this product might work for someone with normal skin. Mine is very dry and it doesn’t provide lasting effect. You also have to like the geranium smell (not my cup of tea). The bottle lasts about two months if not used daily. I love this oil! It's so hydrating, I have patches of eczema on my arms and since using this I don't have them anymore. The smell is divine and makes my skin look gorgeous. I will repurchase. It's a classic smell that I often associate with Aesop - robust, herbaceous, soothing. Sinks in well into the skin although it's quite a dry oil and I ended up using more than I expected. But you don't feel sticky and the smell really lingers.